Each time a new book by Diana is published, readers in different countries around the world want to know when it will be available in their area. She announces release dates in each country or publishing region as soon as she knows them. Other than that, the following guidelines may help. At right, a version of OUTLANDER published in Spain, Forastera, or "Outsider" in the Spanish language. 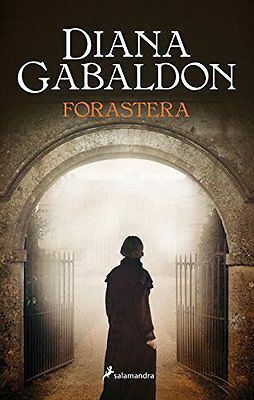 New books by Diana, including the OUTLANDER series and Lord John series, are usually released in the United States first. Canada usually publishes a new book from Diana on the same day that the U.S. version is released. Germany will likely publish and release a new book quite close to the same date as the U.S., perhaps a little sooner. 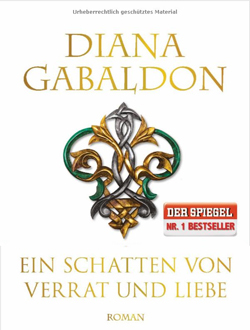 At right, the cover for Feuer Und Stein ("Fire and Stone"), a German-language version of OUTLANDER. Almost all other non-English publishers will publish a new book from Diana about a year after the U.S.A.-English edition is released. Why? Because they have to allow time for translation to another language, and “a Big Book takes a long time to translate,” says Diana. Why does Germany publish sooner than other non-English countries? Germany gets much faster translation because Diana a close personal relationship with the German translator, who works with her as she writes. Diana discussed international publishing dates in her blog from November 15, 2013. News on German-language versions of Diana’s books may be found on Diana’s German-language site, maintained by Barbara Schnell.